Today, forest health and the management of threats towards it are attracting more and more attention on a global scale. This book covers the most recent advances in the management of forest diseases, including the epidemiology and infection biology of forest pathogens, and forest protection based on integrated pest and disease management approaches. 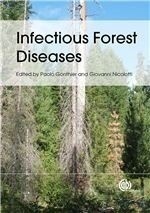 A comprehensive range of diseases caused by viruses, bacteria, fungi and other organisms are discussed in detail, making this book essential reading for forest managers and extension specialists. Written by recognised authorities in the subject of forest health, this book also provides a wealth of information useful for researchers and lecturers of forest pathology and ecology.